While I sometimes write music I spend far more time listening to and writing, or at least thinking, about music. And my performing chops need not even be discussed. But my compelling interest in music has been aided by my continuing efforts to improve my ability to read music. I recall as a teenager the geeky thrill I got out of receiving an omnibus volume of orchestral scores which included Berlioz’ ‘Symphonie Fantastique’, Dvorak’s 9th and Rachmaninoff’s 2nd among others. 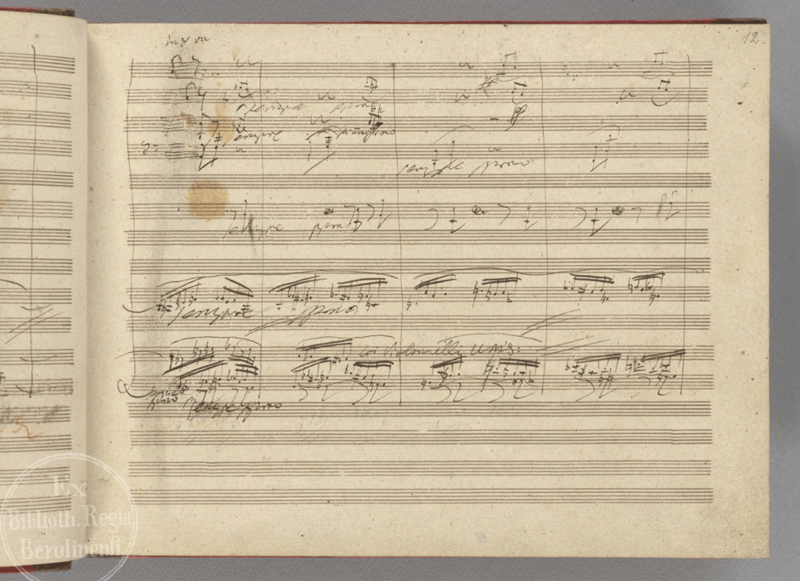 The scores were compactly produced so as to fit a lot of music on not a lot of pages but they were readable. I spent hours learning to follow along as best I could learning along the way many of the subtleties of the music and enhancing my appreciation. Now the digital age has at least a couple of apps for that. I recently downloaded the ‘Open Goldberg Variations‘ and the Beethoven Ninth apps from, of course, the Apple store to my iPad. The ‘Open Goldberg Variations’ is a free app that includes a complete performance of Bach’s ‘Goldberg Variations‘ on the piano by Kimiko Ishizaka as well as a complete score with a cursor that handily shows you your place in the score as it is played. This is a useful learning tool on many levels. It is a creative commons zero license which is basically public domain and is available for free. You can download an mp3 file or a wave file and you can download the iPad app which contains the recording and a score which is executed on the open access Muse Score composition program. I have also downloaded the Muse Score program (available at musescore.org) and find it to be an extremely flexible and constantly developing platform that provides many compositional and analytical tools for a budding composer or a professional one included nested tuplets, harmonic analysis, provision for alternate tuning systems and a host of user created options as well. I intend to write more about this as I negotiate the learning curve. 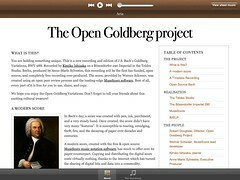 Another iPad app which I recently downloaded is called, “Beethoven’s Ninth Symphony“. It features 4 different recordings of the symphony (Ferenc Friscay and the Berlin Philharmonic from 1958, Herbert von Karajan and Berlin Philharmonic from 1962, Leonard Bernstein and the Vienna Philharmonic from 1963 and John Eliot Gardiner with the Orchestre Revolutionnaire et Romantique from 1992). With each recording you can follow the score in contemporary notation fonts, the original manuscript in reproduction or a graphical representation of the orchestra highlighting which instruments are playing at a given time. In addition you can view what they call a “curated score” in which only the score parts for the instruments which are playing are shown. There are indicators of the key in which the orchestra is playing to aid in understanding harmonic modulations as well as a running commentary on what is happening in the music in a sort of poetic description written by David Owen Norris. The app, which retails for $13.99 USD seems to me to be a bargain for the interested listener or the student. Learning to read music has greatly enhanced my ability to appreciate music and I think these apps are delightful and easy to use learning tools. I look forward to more of these in the future. I wonder too if we will begin to see audience members following scores on their iPads in concerts. Interesting development. Perhaps this will motivate composers to do some creative interactive things with iPad apps in the concert forum.